There are few things in life more stress-inducing than a sea of cross people pushing and elbowing their way through a train station. And yet it is this sound of tutting and passive aggressive ‘excuse mes’ which so often bookmark the beginning and end of the working day. For those travelling on public transport, the daily commute will leave you flustered yet ferocious, bruised yet brash. A warrior on wheels, you will learn to hold your breath during carriage-filling farts, and roll your eyes forcefully when the woman next to you screeches down her phone at 6.30am. And yet, in all my years squished against sticky windows on the Greater Manchester Metrolink service, I have never suffered anything quite like the scenes captured during a commute in Mumbai. On 7 July, 27-year-old Nikhil Bhosle headed to Thane station in Mumbai to drop off a friend who needed to catch a train. However, they were greeted by an intense rush-hour crush which made it impossible for the friend to even set foot on the platform. 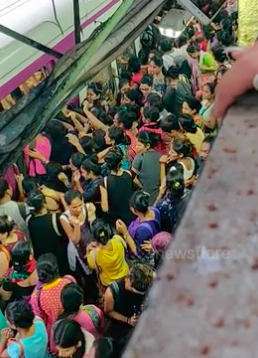 It was then Nikhil decided to film the extraordinary sight, giving an insight into the reality of commuting, Mumbai-style. After two trains passed, I thought of filming the stunning crowd. 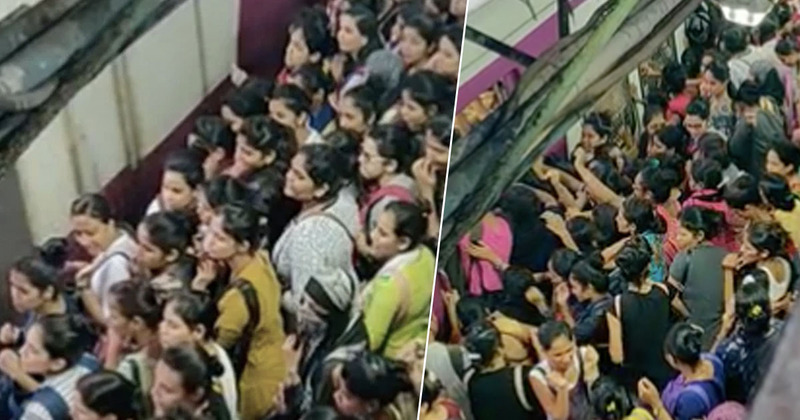 In the footage, countless female commuters can be seen swarming towards the women’s compartment door before the train even stops moving. Once the train stops, the women exiting the carriage struggle forwards onto the platform as those waiting to board charge their way to the open door. A few even cannot shove their way out and are forced to stay on past their stop. 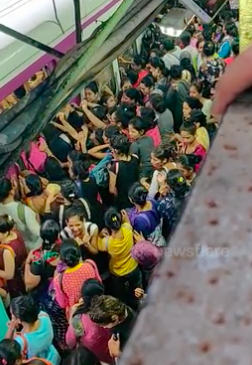 Some women hoping to board are left helplessly pushed and pulled around in the tide of frantic commuters. Others know there would be no chance in forcing their way through the solid block of bodies, hanging back and hoping to get their spot next time. According to Nikhil, ‘long route’ trains bound for Karjat and Khopoli create comparable crushes during peak times. I live close to my office and I ride a bike. We waited for a few trains to pass. After 9th or 10th train, the crowd subsided a little and she managed to get in. What a palaver. Unfortunately, Nikhil’s stressful drop-off is a far from rare occurrence. Almost 22 million people live Mumbai, which is the financial capital of India. The public transport system has infamously failed to keep up with the population explosion, creating serious issues for frustrated commuters. Another challenge is that people have to board trains before they stop. I always timed my jump, leaping inside the coach and grabbing the handle of the door or the arm of another commuter to steady myself. If I am lucky enough to find a seat, I feel a sense of accomplishment. How you feel about such gruelling train travel depends on how you think about it. You could either love it or you could hate it. It’s taught me to be more tolerant and patient. These journeys bring people from different backgrounds together every day and they share a common goal: they want to reach their destination on time and alive. Do you think you could handle this ultimate commute experience?